Hawaiian Treasure slot machine from Playtech, as the names suggests, whisks us of to the tropical island paradise of Hawaii. The mobile slot was originally developed by Ash Gaming, which has now been acquired by Playtech, and that is noticeable in the rather un-inventive use of stereotypical images on the games 5 reels. There is a free spins bonus feature in the game which awards 12 free spins for the lucky punter. Keep reading for the Hawaiian Treasure slot review below. Escape to a South Pacific paradise in the Hawaiian Treasure slot – a brightly coloured, tiki-themed slot from Playtech slots that features a healthy 1,000x base game jackpot and a fairly unique free spins feature. 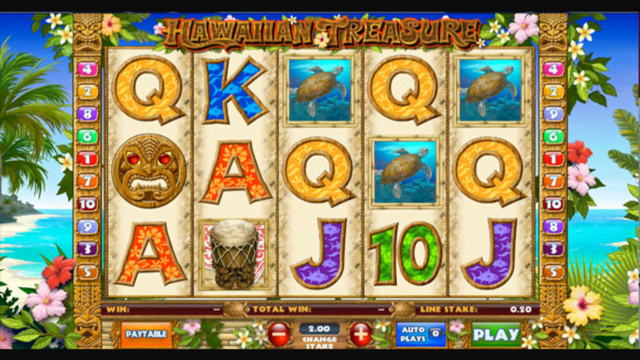 Played across five reels and just 10 paylines, the Hawaiian Treasure slot machine is outwardly a very basic game and this notion is only furthered by the presence of the conventional ace-through-ten playing card symbols on the reels. Alongside these, players will see flowers, drums, ships, turtles and hula girls all feature as higher value icons, with the tiki mask fulfilling the dual role as the game’s bonus and wild symbol. Playable from as little as £0.10 per spin across all desktop, mobile and tablet devices, Hawaiian Treasure offers a relatively steady 94% return to player – though to ensure you hit this theoretical figure, you’ll need to trigger the free spins feature regularly, as this is where the big wins come from. As mentioned above, the wooden tiki mask symbol is used to trigger Hawaiian Treasure’s main bonus round, and players will need to land this icon anywhere on reels one, three and five simultaneously to get the feature started. Should they do this, they’ll be rewarded with 12 free spins and then prompted to pick three masks from a selection of five to determine which symbols will appear during the feature. Naturally, only having three symbols in total significantly boosts players’ chances of landing valid payline combinations, but it also comes at a price. Indeed, given the wild symbol is no longer present on the reels, players cannot use it to complete paylines, nor are they able to re-trigger more free spins. Nevertheless, if they manage to get a good run going in this feature, players will still be able to walk away with some tidy payouts before being returned to the base game. In truth, this is just as well as there really aren’t many other opportunities to land meaningfully-sized wins throughout the game. Although the graphics are bright and colourful and the free spins bonus round will certainly hold some appeal to players, the Hawaiian Treasure slot struggles for an identity due to its lack of distinguishing features. Like the Hawaiian Treasure slot review? Check out these as well…..